If you’re a big fan of sci-fi shooters, we know that it can be difficult to find the guns you want! There are so many guns on the market but there isn’t one to scratch your sci-fi itch. There are so many guns that are popularized since they are used in the military but not many that are made due to video game influence. However, that does not mean that there isn’t any being made, which brings me to the article’s main topic! Let me introduce you to these awesome sci-fi guns that might just relieve you of your sci-fi itch. What is a Futuristic Airsoft Gun? Usually, what looks and seems futuristic depends on innovative technology followed by creative designs. Some futuristic guns are also inspired by video-game franchises or newly found military technology! In airsoft, however, futuristic guns might not provide you with innovative technology but more so, a creative look and a unique style. When manufacturers make airsoft guns, they have the freedom of designing cool weapons without having to worry too much about how the BB will shoot out. This is because many guns operate with a gearbox and gearboxes can be designed to fit even in tiny compact guns like a P90. In fact, there are even electric airsoft pistols that operate with a gearbox! When you rock a star wars blaster rifle as your primary airsoft weapon, it’d be even cooler if you had the equipment of a stormtrooper. This isn’t the primary focus of the article but it deserved an honorable mention because I personally believe that if you wanted a futuristic airsoft gun, you’d also try to get equipment that looks well with it. Here’s a cool Boba-Fett helmet that can go along with your star wars blaster rifle. Before you consider purchasing this helmet though, make sure that it can withstand the impact of a BB! If it can’t, you’ll need to add some modifications. What I would suggest is to buy Lexan plexiglass and reinforce the areas around your eyes. Get some silicone adhesive, a cutting-tool, your Lexan and you’ll be ready to go! The last honorable mention goes to the Dye I5. It is a paintball helmet/goggle but it can also be used for airsoft! The reason why I wanted to mention this is because it gives a really nice sci-fi look and is extremely reliable. The wide-view of the helmet makes it so that there isn’t anything to obstruct your view. It also won’t fog up during your gameplay and you’ll be able to have a fog-free protected setup. This Halo MA5B Assault Rifle is one of the most futuristic airsoft guns that have come to the market. Not only does it replicate the infamous halo series assault rifle but it comes with innovative technology that no airsoft weapon has. This innovative technology is its infamous ammo count. On the weapon itself, there is actually a LED number that will go down and reset when you reload/shoot. Not only that but the gun won’t even fire if you do not have a magazine in. This is a gun that has been made with care, realism and pleasure. There also LED powered lights on the gun that tell you whether or not you are on semi-automatic or fully automatic. So all in all, You’ll be able to keep track of how much ammo you have left in your gun, look cool and have a reliable weapon to depend on. G&G is a manufacturer known for making solid entry-mid range rifles. I wouldn’t doubt the reliability or durability of these rifles due to my positive experiences with the brand. When considering the FN2000, your futuristic itch might be finally cured since the history of this is extremely new. Created in the twentieth-first century and combined with bullpup technology, you’ll see yourself with a compact, futuristic look that you can bring with you into your battles! SRC is a brand that has improved over the years and I wouldn’t worry too much about faulty parts or the chances of obtaining a lemon. When considering the SM8, know that the US Army wanted to replace the classic M4/M16 with the new and improved XM8. Hence, the popularity of the gun shot up with its cool futuristic look that many airsofters are looking to have. All in all, the SM8 is a solid gun designed to be lightweight and brings a cool space-ish theme to your setup. This is a fairly new airsoft rifle that has just arrived in the market. Many airsoft youtube channels had reviewed it and I’ve yet to find a negative review on it. Its futuristic look and low price means that it is affordable coupled with being stylish. It is compatible with the mainstream M4 magazines and gives off a really nice halo-themed look! With its low price, I wouldn’t mind getting it for myself and using it as a back-up rifle in case my primary fails! This SL9 reminds me of a futurized G36. Its longer, more ergonomic and is made out of high quality polymer. Its function seems similar to a DMR style weapon and with its lightweightedness, it will allow you to be able to move positions with ease. The look of this gun’s stock reminds me of the Halo Sniper Rifle which makes me curious to what Halo players think! It might not be as futuristic as the other guns but it definitely gives off the vibe that you might be searching for. Reliable and affordable, this Sterling looks extremely similar to the star wars blaster rifle which actually inspired someone at my field to get it! The similarities are prominent and if you’re looking for a tactical, futuristic gun, the S&T Sterling can definitely give off that impression. Although the actual gun is old itself, the S&T Sterling comes with as Heat Sink which made me misidentify this gun as a Star Wars Replica Blaster. That being said, if you are looking for a futuristic weapon or the actual Sterling itself, you might be surprised with the results of your newly purchased gun! If you’ve ever played CrossFire in the old days, this might remind you of the M4A1-S Iron Beast. The Star Dragons design is extremely unique and you’ll definitely catch glances as you bring this along in your field. Its ergonomic and compact so it’ll fit in the sub-machine gun class. Surprisingly enough, its low cost might make you think that it’s unreliable and made poorly BUT it is actually a good gun. It is sturdy and comes with a surprisingly good gearbox. It is also compatible with standard M4 magazines. One bad con about this gun that I’ve heard a lot of , is that its battery space is quite depressing. You probably have to buy a separate battery that can fit inside the small compartment but other then that, you’ll mostly find enjoyment with your experience of the JG STAR Dragon AEG! To judge a Futuristic Airsoft Gun, it’s not about the attachments, nor the performance. I personally feel that it all comes down to design. 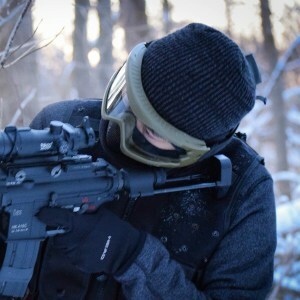 In airsoft, you can’t rely on innovative technology coming out left and right but what you can rely on is, creative designs being tried out by manufacturers. You’ll want your sci-fi, futuristic looking gun to match your setup and if you pull it off right, you might even be able to win loadout contests on the internet! Thank you for visiting iamairsoft.com! For great products and more information about the game, check out our Airsoft Buyers Guides and Airsoft U!